about this book: There are loads of animal rescue centres in Cyprus. Sadly, cruelty to animals is endemic and you often see dogs wandering the streets after being dumped by owners who no longer want them, especially at the end of the hunting season when they're deemed to have served their purpose. The centres are always full and there are as many kind people here as there are cruel. Some of the abandoned dogs are saved and sent to other parts of Europe. We adopted our rescue dog Sandy (formerly Sansa) on 14 March 2018. I wondered what story she would tell if she could talk and voila, The Island Dog Squad series of novellas was born. • "I have nothing but the highest of praises to sing for this thought-provoking, tear-jerking tale of torture, death, hope and survival." • "Anyone who's had the privilege of sharing their lives with an animal companion will love Sandy's story ... most highly recommended." All skin and bone, Sandy is picked up off the street by a kindly couple and delivered to a shelter. She is trained by specialist military personnel and along the way meets Lola the pug who becomes the leader of the dog squad and friends for life in Obie and Chip. All have mission names and strive to help other dogs in their war against cruelty and injustice. Sandy starts having flashbacks, and as her past slowly unravels and her memory returns, she must make a choice that will determine her life and her future. 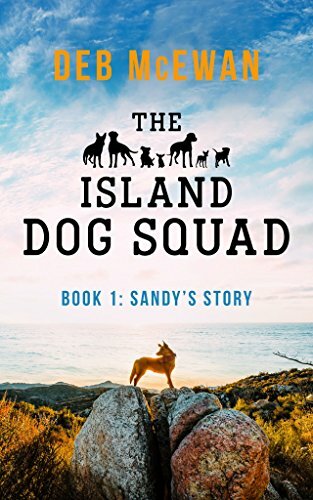 'The Island Dog Squad'; an animal action and adventure novella, told by Sandy the rescue dog.